I am making list of things to do for a USA road trip staring in March, April, May of 2012, it will be fun, Andy Graham 90 countries, 14 years of travel. I am making plans to travel around the USA in a mini-van for about 3-5 months, I would probably do about 35 states or until I am bored, or poor, or tired of Americans. My life is simple, and I keep it simple by not making stupid decisions, I do my best to avoid biting on the possibility of problems. That is probably the buzz phrase for how l plan my trips, I am more than willing to delay a trip if there is even the remote chance of discomfort or stress. But, then again, I have no pressing plans for the rest of my life, I can do as I wish today, and that make life simple. I talk to a few retired people that are very busy, I think they entered the world clueless, and will leave clueless. 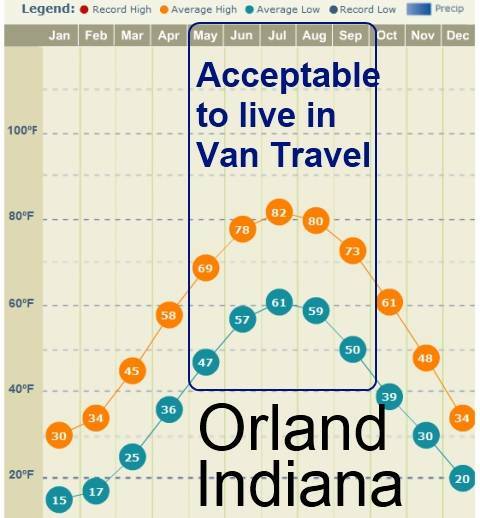 I like to fall into the obvious, there are some obvious good decisions in life and if you look at the average temperatures above, then maybe waking up in a van at 47 degrees Fahrenheit is OK in May 2012 for me. Americans deal with a lot of weather crap, Europe is two times worst, it is one of them cultural things, they have always been cold, so what is new? Wearing a jacket for seven months of my life is outside my acceptable dream for my life. That mean, Indiana is only good for me about five months a year, the rest of the time I am going to be in the Tropics avoiding this I-Got-To-Accept-The-Weather crap. I do not have to accept the weather, and anyone trying to make a USA road trip should not accept the weather. The cost of all travel doubles, triples or quadruples with cold weather. It is close to impossible to shop around for room in extreme cold, and I cannot just say screw it, and go sleep in the van if it is below freezing. My List of USA Road Trip Problems to Solve. 1. Buy a mini-van for between 1000 and 2000 USD. 2. Buy prepaid USB wireless Internet Modem access that works for the whole USA, I am hoping to get this for around 125 per month on an unlimited bandwidth plan. Help? I can do all the purchase while on the road, all I really need to do is figure out how to make hot water with 12 volt for a hot water dip shower in the back of the van. So, in a way, I will need to construct a waterproof area with a drain at the back of the van, this is easy enough for a person that can fix anything but a broken heart. Contrary to any plan ideas, living in vehicle is boring, I need to leave a lot of things to do, so I can keep my mind busy. If you would like me to stop and sleep on your couch for free, eat all your food, then click on the contact button above. Andy Lee Graham 14 years of International Travel, and trying to get back in touch with my own USA culture by making a USA Road Trip. 90 countries that are easy, and now opting for a hard one, and Europe is truly a mess, a horrible place to travel. I like wanderlust, and the USA and Europe kick that word in the teeth, wander is a hard thing to do, when you have to fight everything, and the tropics remove the weather variable. Andy Lee Graham in Montellano, Dominican Republic I will probably fly to the USA at the end of March 2012. I would suppose on how to work them. Thanks, I will keep all this vary simple, a shower and a mattress. Well, I know you don't like California, but if you are ever in the state my family would love to say hello to you, maybe we could even invite you over for dinner. As far as a USB modem goes I would vote Virgin Mobile. I use them, they are valid across the USA, the device costs $80, no contracts, and the data costs $50 a month for unlimited (but they threaten to throttle you after 2.5 GB, but they have never done it to me). I will look for someone with a brain at Virgin Mobile. The great thing about the USA is the ablity to call someone before you go, that does not work internationally, I must go to very place and talk. I like California, and southern California surf boardwalks are great. I do want the world to know that California is not the USA and the culture has lost the plot. Immigration or emigration to a location almost always causes problem, and California is damaged goods.